When creating your own videos you know you need to have the basics; a camera, tripod, a microphone and some lighting. However, there are some camera accessories (small tools) that make a big difference on set. When you’re doing video production you always need to be able to tighten your tripod plate and this piece works perfectly. Who has a quarter on them these days? 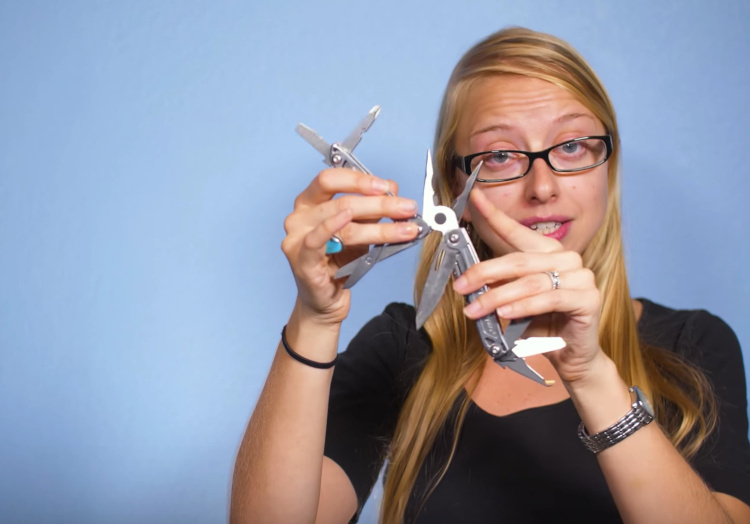 Keep this tool in your camera bag to always have something sturdy and reliable to tighten. Other features of this multi tool are a small screwdriver to tighten GoPro pieces, a small scissor in order to trim stay threads sticking off your clients. There is a small nail file. You never know when you’re waiting for a client or talent to show up and you want to fix your nails. There is a can opener and a few sharp knives, a small ruler on the other side of the nail file and really is every tool you need for when you’re on set and need to tighten items. For us it’s even come in handy when going camping. It’s just a great multitool to have with you at all times. We personally have two. One in our camera bag at all times and one on our desk. We have been using magic arms for a long time and many of them broke in less than a year, however knock on wood, we have never had one of these break on us and we’ve had them for almost two years. As you can see they are really versatile in how you can position them, and we personally use it to hold our Zoom H6 to the side of our tripod. So it can hold a decent amount of weight however I wouldn’t connect a camera or anything to it, only accessories. You loosen the whole arm, by loosening this one knob. It’s magical. There is a cold shoe mount included if you need one. For less than $20 this is a really a great tool. In order to have the perfect color temperature, you want to get the right white balance. Sure, you can use a thick piece of paper or poster board, however this white balance card is perfectly white, is a foot large when completely opened and can be quickly folded up to three inches to fit just about anywhere in your camera bag. Although these tools are small, they can still make a big difference when you’re on set. Also what is your production set? Do you need to have an entire large studio and a green screen? See our post on “Going Green! Green Screen Studios, When To Use Them & How”.